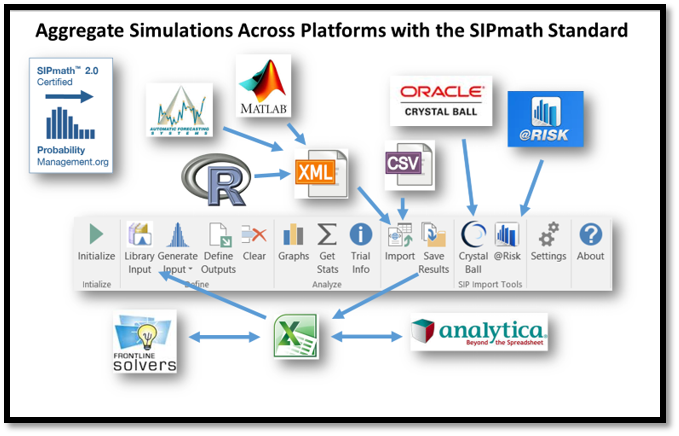 The SIPmath Modeler Tools leverage the native Excel Data Table function to bring interactive Monte Carlo simulation to all Excel users. 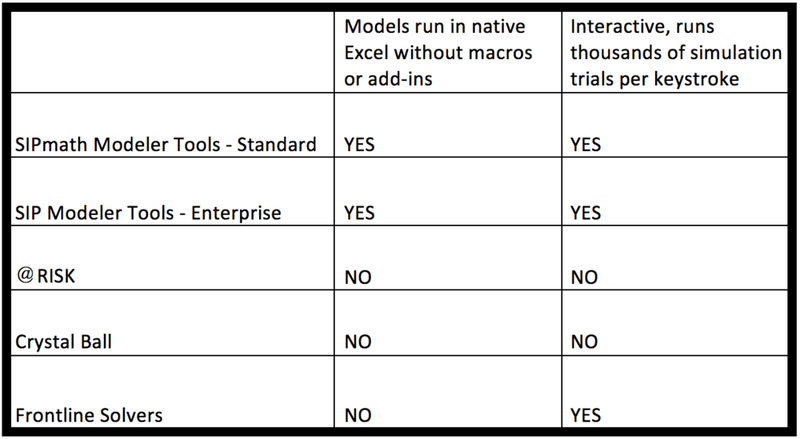 The models built with these tools do not require the tools to run in Excel. ProbabilityManagement.org announces a paid Windows Enterprise version of our our SIPmath Modeler Tools for Excel. We still recommend that you download the Standard SIPmath Modeler Tools for Windows or Mac at no charge to get your feet wet. Then move up to the paid version when you need more performance, more support, and less guilt. More Performance: See the chart below for a comparison of the standard and enterprise versions. More Support: Receive one hour of technical support when you purchase the Enterprise SIPmath Modeler Tools. Less Guilt: Both versions of the SIPmath tools are unique in that they create blindingly fast simulation models that run without the tools themselves. We know that many of our users feel guilty about using such a great product without supporting nonprofit ProbabilityManagement.org. The fee of $500 for the Enterprise version will make you proud to have helped us fulfill our mission of improving the communication of uncertainty through education, best practices, and standards. Imagine building a birdhouse with a saw and hammer, and then requiring any bird using it to buy their own saw and hammer. That is the current paradigm for spreadsheet simulation software. But the SIPmath Modeler Tools create models that use the native Excel Data Table function. The result is an XLSX file without macros or add-ins, which may be shared with 500 million of your closest friends. The models produced, depending on size, can run thousands of simulation trials per keystroke. Most other packages require a command to be executed to run a simulation, and the results are not instantaneous even for small models. Think of a bicycle with a command line interface. You type "Lean Left," hit the Enter key and plow into a fire hydrant. Once you are exposed to real-time simulation you will never go back. Click on a button to watch the feature's tutorial.